If a business trip to Jakarta is on your agenda, it would be a good idea to get basic information on the city prior to departure to help you make the most of your stay here. 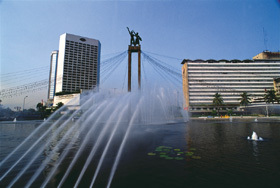 As a city of commerce like Singapore, Tokyo, Hamburg or New York, Jakarta sees plenty of visitors coming to the city for business purposes. With a high standard of meetings and convention facilities, the capital is one of the country’s top convention destinations. The others are Bali, Yogyakarta in Central Java, Medan in North Sumatra, Surabaya in East Java, Bandung in West Java and Ujung Pandang in South Sulawesi. These locations offer high-standard facilities and services, professional management, state-of-the-art technology, exquisite scenery and unique cultures.